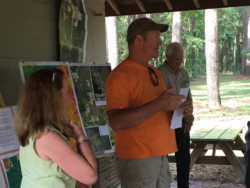 Here is the detailed story and videos of what Ted Yoho FL-03 and others, saw, heard and said on the hike where Sabal Trail proposes to drill under the Suwannee River as well as a new development. Rep. Sanford Bishop GA-02, has sent a letter to the Army Corps of Engineers asking for a SEIS without even attending this hike or witnessing the sinkholes and other karst topology ‘omitted’ by Sabal Trail’s EIS which was used to receive a FERC and FDEP permit. Rep. Bishop obviously has the common sense to realize that a 36″ high pressure fracked gas line to export natural gas to other countries for the profit of Big Oil, through one of the world’s largest karst (sinkhole) prone areas, which also happens to be THE major recharge/discharge zone for the Floridan Aquifer is a very bad idea. Especially since the Sabal Trail Pipeline (subsidiary LLC of Spectra Energy) is crossing Florida’s sole source of water for millions of citizens in Florida and Georgia, is unnecessary and very dangerous. We’re still waiting for Congressman Ted Yoho of FLA district 03, to make this a bi-partisan bi-state coalition, as he promised, by asking the U.S. Army Corps of Engineers for a Supplemental Environmental Impact Statement (SEIS), BEFORE Spectra Energy’s lobbyist, Steve Tillman, met with our Congressman representing us in Washington. Please click here for contact info by state for you to contact the Army Corps of Engineers and request for a SEIS on the Sabal Trail Pipeline to be initiated and sign a quick and easy petition asking Congress for the same by Gulf Restoration Network. 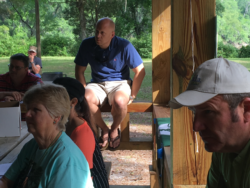 On May 15, 2016, representatives of nine environmental groups, some from as far away as Washington, DC, geologist Dennis Price, Suwannee County BOCC member Clyde Fleming, and other officials as well as concerned citizens from Florida and Georgia met with elected officials, including US Congressman Ted Yoho at Suwannee River State Park to discuss the omissions and discrepancies, discovered by Chris Mericle of WWALS, in Sabal Trail Transmission LLC’s Environmental Impact Study (EIS). Chris Mericle and geologist Dennis Price led the hike of the pipeline route on the Hamilton County side of the Suwannee to allow these officials and others to see for themselves the numerous sinkholes in and around the pipeline route as well as answer questions from Congressman Ted Yoho (see his videoed response later in this article) as well as other officials and concerned individuals. One other very important discrepancy was the Falmouth Cathedral Cave System which Sabal Trail claims is 100′ underground, a trip to Falmouth springs will show you that is more like 30′. Dye tests put in at Falmouth have shown this cave system is a network of underground caves that are connected to Lime Run Spring and other springs at the Suwannee River State Park. This cave system will be crossed at Hwy 90 just 100 or less feet from Pilgrim’s Pride and about 1/4 mile or so from Falmouth Springs. Sabal Trail plans on jacking up the highway and boring their pipeline underneath atop the Falmouth Cathedral Cave system which is part of our aquifer. 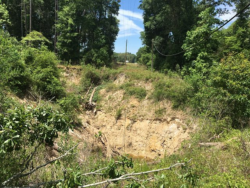 See this picture to the right here which shows a sinkhole right off highway 90 that is 50 to 75′ across and at least 30 feet deep. To the left of this pictured sinkhole is another in the making which is holding some water but the clay plug could go at anytime. When is a supplement – SEIS – to the EIS required? An agency makes substantial changes to the proposed action that are relevant to its environmental concerns. There are significant new circumstances or information relevant to the environmental effects that have bearing on the proposed action or its impacts. If an agency decides to supplement its EIS, it prepares, circulates and files the supplemental EIS in the same fashion as a draft or final EIS. It is obvious that there are significant new circumstances or information relevant to the environmental effects that have bearing on the proposed action or its impacts concerning the Sabal Trail Pipeline. “Think of our regulatory agencies (yes all of them, including the EPA, Army Corps and FERC) as the DMV. It is always up to the person who wants the license or the “permit” to bring the documents needed to get their license, in this case Sabal Trail’s. The DMV just tells Sabal Trail what documents they have to provide & then reviews them. Now if your insurance company (aka Gulf Restoration Network or whomever) tells the DMV, hey- this person is a risk and we can prove in these documents provided by our experts that what they are telling you is not true” the DMV reviews the two parties documents and decides who is right. In this way the burden for providing evidence is always placed on the person asking for the permit, or those who don’t want them to have it. The burden is never on the DMV to do a 3rd “independent study” separately to show that the driver is safe, or that the insurance company is right for one drivers license request. They just look at the documents in front of them. With a Supplemental Environmental Impact Study we have the opportunity to be the insurance company to Sabal Trail, and tell the Army Corps that they are too big of a risk to be given a license. AND if the Army Corps (aka the DMV) gives them the permit anyway, we can sue because we put it on the record that they knew about our concerns and didn’t make the right decision.” — Thank you to Johanna deGraffenreid of Gulf Restoration Network for this easy to understand explanation. Geologist Dennis Price and another private geologist have done independent geological surveys of the pipeline route, to be bored 675′ off bank under the Suwannee River as has the individual who owns the property across the river where the pipeline will exit from underneath the river onto his property. 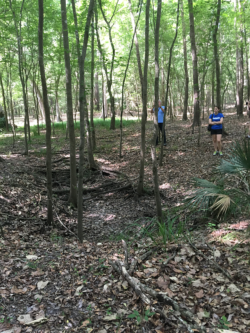 Their reports as well as what can be seen with the naked eye onsite contradict what Sabal Trail has submitted to FERC and FDEP to receive their permits, that the closest sinkholes to the pipeline are 750′ away. They also omitted the fact there are karst fractures — future sinkholes. You do not have to be a geologist to know that sinkholes are prevalent in Florida and especially in the Suwannee River area, as is flooding in Suwannee and all of the counties this pipeline and related compressor stations will be located. 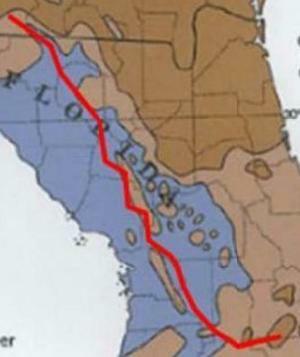 In fact the Sabal Trail pipeline follows the USGS Map of Karst (sinkhole prone land in Florida) to the tee. “I moved here with my family from Jacksonville. Moved here to do organic farming…. Unfortunately perhaps going to be neighbors to a time bomb, or what they call a compressor station, built by Sabal Trail, so we’re obviously in opposition to that. We have quite a few children and being a quarter mile a way is not not exactly something we like to do, or anybody.” Note that emissions from compressor stations have been shown to cause nosebleeds (caused by formaldehyde) which elevates blood pressure and a myriad of additional health effects — especially with children. The Sabal Trail “Hildreth” compressor station is actually located in O’Brien 1/4 mile from residential communities. Compressor stations not only emit dangerous chemicals into the air ( benzene, formaldehyde) they also pollute the soil (thus groundwater) with methane and the toxic chemicals used to clean them. The pipeline and compressor station will use millions of gallons of water to maintain and clean them both. This is done on a regular basis. Suwannee County cannot afford such high uses of valuable groundwater . If this compressor station was to blow up, and Spectra Energy has had them do that, it would wipe out everything within at least a half mile of it’s location. Thus the Shields and all other residents in the area are in constant danger not only from the compressor station but also pipeline ruptures which with a pipeline that size – 36″ – that Sabal Trail proposes is catastrophic. Everything within at least a mile of the pipeline would be destroyed as has been seen in recent pipeline ruptures which do not always include explosions but can hurl pipe from the pipeline at a great distance at times leaving craters the size of large meteorite activity. Additionally this compressor station is not a small unit, it is a large compressor station that uses two large turbine units and is set for expansion to double it’s capacity by 2021. “Florida Southeast Connection: Florida Southeast Connection, LLC is a wholly owned subsidiary of NextEra Energy. To connect with FPL’s operations, Florida Southeast Connection will construct a separate, 126-mile pipeline from Sabal Trail’s Central Florida Hub to FPL’s Martin Clean Energy Center in Indiantown, Fla. The two projects are expected to be completed and begin delivering natural gas to FPL’s system in May 2017. FPL will purchase approximately 400 million cubic feet per day beginning in 2017, and will increase to about 600 million cubic feet per day in 2020. Now do you really think that the liquid natural gas difference between 600 million cubic feet and the 1 billion cubic feet per day is needed by south Florida industries? Perhaps these distribution centers FPL mentions on it’s website are actually the export terminals that are already permitted to export natural gas to other countries such as South America, The Bahamas, etc. 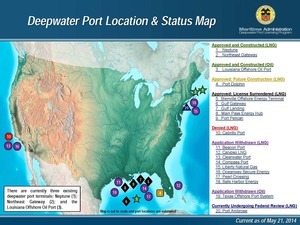 at five facilities including Jaxport. In fact in recent responses from Sabal Trail they have admitted the exporting of this fracked gas. See Sabal Trail’s recent response to Rep. Bishop, WWALS, GRN, individuals and more here (click PDF file). Sabal Trail Transmission LLC is owned by Spectra Energy. NextEra (owner of FPL) and Duke Energy are also owners of Sabal Trail Transmission LLC which has no active board and one active corporate owner who is an employee of Spectra Energy. Sabal Trail Transmission LLC will be defunct as a company when the pipeline is finished with Spectra Energy taking over as operator of this pipeline. Spectra Claims they monitor their pipelines 24/7, yet they did not detect their pipeline rupture in May of 2015 under the Arkansas River. It was not reported until a tugboat operator reported damage to his boat to the coast guard over 24 hours later. His tugboat was damaged by a pipeline casing that contained evidence of charred cement indicating an explosion. Spectra Energy has one of the worst EPA violation records in history including spills of PCBS and other deadly toxins. Spectra Energy has been fined by the pipeline regulatory agency PHMSA for poor or no maintenance practices involving ruptures under the Arkansas River – imagine that happening under the Suwannee River – and elsewhere. Spectra’s safety record is alarming to say the least AND they carry no insurance for accidents , leaks, ruptures, damages , lives — no insurance at all. If this pipeline is installed we are on our own — period. “You know, you guys have been great advocates against the trail coming through here, and I understand that and I hear you. I represent you guys. I don’t represent Spectra. And if your concerns and my concerns to are, when you drill under a river bed, even though they can tell me, it’s not going to cause a problem, I don’t know what’s under there. And my concern is like yours, if you drill under there, if you hit a karst, or you hit [a conduit] or close to one of those shoots going down in the limerock, what happens if you hit the wrong one. That’s my concern as yours is. Yes, I want the energy, but is there a better way to bring it in…. And I want to thank you. You’ve been diligent, ever since I got into office, bringing this to our attention. And to see the discrepancies between what was reported and what we see first hand, I mean these are questions that have to be answered. And so we’ll fight to get those answers before it goes anywhere else. You have my commitment on that. And, uh, we have to have that balance. Because I know not everybody thinks like I do, and I know people will say “thank God” [laughs]. But not everybody thinks the way you do. But in between we have to put that common goal. And it’s hard to find that common goal. It’s not a Republican issue, it’s not a Democratic issue, it’s an American issue. And it’s a Florida issue, and we have to make sure, like you said [gesturing at jsq], generations from now they’ll look back at us. And I want them to say, “you know what? those guys were smart; they did a good thing”. I think that’s all of our goals, and so you have my commitment to make sure. And we’ll weigh in with you guys to let you know which way it’s going. No, they need to be, though. Because I mean, that’s not a problem. We’ve got a great relationship with them and I’ll ask them. They were just up in our office and we’ll say we need to revisit this before we go any further. I’m real concerned about that. We have a letter drafted for you and Congressmen Scott and Bishop to consider. Is it in the package you gave me? It’s in the bus, I’ll get it for you, and I’ll send you the PDF. “After reviewing the multiple studies performed by the geological engineers and reading the reports and opinions of the many agencies involved in the permitting of the Sabal Trail pipeline, I believe the questions and concerns involving the pipeline have been answered satisfactorily. “When infrastructure projects are proposed, much anxiety develops. To give the appropriate authorities the opportunity to put these fears to easy, projects like this take a long time to get approval. “After the required hearings, studies, engineering testing, and comment periods, multiple agencies (such as EPA, Federal EPA, State EPA, FERC, NEPA, Army Corp and a host of other agencies) can weigh in and approve the project. This process should give all concerned a certain level of comfort and trust. After all, these agencies provide the most stringent reviewers of any project. “I believe the Sabal Trail organization has met these criteria. It has already under gone Administrative court reviews and has satisfied these reviews. Therefore, we should feel more than confident that this pipeline has met the highest standards. morning, especially Suwannee BOCC official Clyde Fleming, to let our voices be heard and show what SBOCC, Hamilton County BOCC have already seen the ‘omissions’ and ‘discrepancies’ on this pipeline route. Both counties have written letters to the Army Corps Of Engineers asking for a SEIS before this pipeline is allowed to proceed. Marion County also has requested a SEIS due to ‘omissions’ and ‘discrepancies’ in Sabal Trail’s EIS concerning the Marion County area. Jake stayed with us all day accompanying us on a trip to Falmouth to discuss the Falmouth Cathedral Cave System which extends to Suwannee River State Park and to the site by Pilgrims Pride site where the Sabal Trail pipeline (pictured above) will be bored under HWY 90 just around 70 feet from a 50′ wide and at least 30′ deep active sinkhole. This battle to protect our water, resources and very lives is not over. Suwannee, Hamilton, and Marion counties have sent letters to Army Corps of Engineers to ask for a SEIS rather than have an industry company, Sabal Trail, do it’s own study. That is like the fox watching the hen house. With FERC funded by the same industry it regulates as well as our own Governor Scott being personally invested in the Sabal Trail pipeline AND the man who is responsible for hiring the people at FDEP as well as all Florida agencies — you can bet our safety and well being have not even been considered. This project will bring zero long term jobs with very few low paying jobs, as Spectra and Sabal Trail will bring their own crews out of Texas to lay the pipeline. Local jobs will be limited to food service, some paving, rock hauling etc. and will only last about 60 days, if that, before the crews move on and temporary local jobs end. Again our governor attempts to line his pockets — his wealth has skyrocketed ever since he took office — all on the backs of people desperate for work who only seem to get minimum wage jobs with no health insurance. Florida is an unique and ecologically sensitive state whose economy depends upon mostly tourism and ecotourism. For instance Suwannee River State Park where Sabal Trail proposes to bore under the Suwannee River putting the prings there as well as all outdoor activities at risk. The report Outdoor Recreation and Trails states, according to the Florida Outdoor Recreation Economy Report, consumers spent $38.3 Billion last year, creating nearly 330,000 jobs, generated more than $2.5 Billion in State and local taxes as well as $10.7 billion in wages. The Sabal Trail Pipeline will not even touch these figures in jobs, taxes or consumer spending. In fact if this pipeline is allowed to be installed, there are more pipelines already planned throughout the state, including a Kinder Morgan gas pipeline to run from Tampa area carrying Sabal Trail Fracked gas to export out of Jacksonville which is crossing near the Ichetucknee and Sante Fe Rivers in Gilchrist, Suwannee and Columbia counties. This is not taking into account the fracking that the oil industry is pushing with the blessings of our oil/gas invested Governor and his self appointed agencies. Let us not let Florida become like Pennsylvania and the other beautiful states ruined by the unnecessary fracking and pipeline industries. Our mainstay for our economy, tourism, will see a drop, there has already has seen a drop last year as natural resources such as springs, beaches, and other one of a kind natural resources are ruined beyond repair by the oil and gas industry (BP Oil Spill) and lack of adequate protections by our state government. Imagine Florida crisscrossed with gas /oil pipelines, roads with bomb trucks and train bombs on both coasts and it’s ports filled with dangerous gas export terminals …. or imagine an economy based on natural wonders seen nowhere else. An economy that is safe for the people and the environment as our natural treasures – springs, rivers, waterways and Floridan Aquifer are protected not exploited. Let us not sit back and watch as oil companies come for our resources much like carpetbaggers for THEIR profit alone leaving our one of a kind state in ruins. First please contact your Army Corps of Engineers in your state to request that a Supplemental Environmental Study be performed before they issue a permit for the pipeline and then please sign the petition linked below to contact Congress to ask them for a Supplemental Environmental Impact Study. Get involved and educate yourself. Contact your legislators especially here in Florida and let them know that you oppose the Sabal Trail pipeline, any other pipeline or other activity such as fracking, that would disturb Florida’s limestone based land and connected aquifer. The Floridan Aquifer of which 97% of it’s recharge/discharge zone is located in Suwannee County Fla. A county that Sabal Trail/Spectra Energy has included in all 12 of it’s pipeline route plans. There are a growing number of individuals and groups that are fighting this and other CONNECTING pipelines to export fracked gas all over the USA to other countries for oil/gas company profits at a very high cost to the people as methane leaks have been found to cause a much higher carbon issue than any other fuel and have been under reported as can be seen in this press release about the pending legal action against a high ranking EPA official who purposely caused an under reporting of these leaks on behalf of the -oil and gas industry. Florida — The Sunshine State — is one of only four states that does not allow Solar Power freedom to it’s citizens. If you have read this far then you know why. Be sure and vote NO on amendment one — the fake solar amendment put on the Aug 30 ballot by Florida’s monopoly utility companies and the Koch Brother’s – and YES on amendment 4, written by the Florida legislator to remove tax barriers for those who wish to install Solar power. Let us take Florida out of the dark ages and into the light as our neighboring state Georgia has — they are #1 in solar power growth. Also support Floridians for Solar Choice by gathering petitions to put an amendment on the 2018 ballot for the right to decide where you buy your power from. Energy freedom and Energy Democracy for Florida’s citizens. Remember the legacy we leave our children, their children and so forth is for at least seven generations. Let us have them say we did the right thing by them. 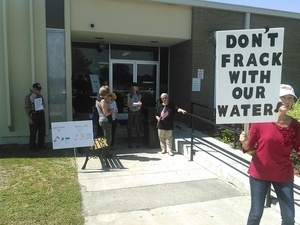 “No fracking!” said the students, as nine people protested outside Sabal Trail’s Contractor Fair at RiverOak Technical College, Live Oak, Suwannee County, Florida yesterday, 20 April 2016. 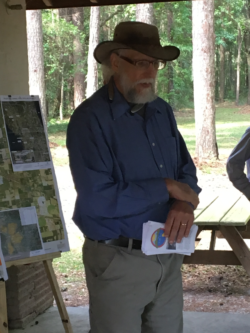 SpectraBusters, Suwannee-St Johns Group of Sierra Club Florida, and WWALS were among the groups with members on the ground, with the other groups listed on the flyer we were passing out there in spirit to say Short­term jobs are not worth long­term Sabal Trail risk. Here’s the press release, which was picked up by Valdosta Today. Live Oak, FL, April 18, 2016 — Local residents and half a dozen environmental organizations want applicants at Sabal Trail pipeline job fairs to know a job for a few weeks isn’t worth risking drinking water for all our families and children and grandchildren. Opponents of the Sabal Trail fracked methane pipeline and supporters of solar power include the Suwannee-St Johns Sierra Club Group, St Johns Riverkeeper, WWALS Watershed Coalition, Our Santa Fe River, Earth Ethics, Gulf Restoration Network, and SpectraBusters. Help secure an independent investigation by the Government Accountability Office into the abuses of power, process and law by the Federal Energy Regulatory Commission (FERC) when it comes to interstate natural gas pipelines and LNG export facilities. Write your congressional representative now to urge their help in securing this necessary independent review. Here’s a handy web form by Delaware Riverkeeper Network. Here’s why Sabal Trail and all the other fossil fuel profiteers avoid jury trials at all costs: when twelve peers of the afflicted decide, the frackers lose. But money isn’t enough. That land and water is permanently poisoned. There’s only one real solution: end fracking, to end all its new pipelines, compressor stations, bomb trains, and LNG export. A Pennsylvania jury handed down a $4.2 million verdict in a lawsuit centering on water contamination from negligent shale gas drilling in Dimock, PA, a tiny town that made international headlines for its flammable and toxic drinking water. Now streaming online: At What Cost? Pipelines, Pollution and Eminent Domain in the Rural South, by Mark Albertin. And yes, he’s happy for it to be shown elsewhere; just ask, and you can set up a local viewing like in Live Oak last night, or the previous premieres along the Georgia coast. 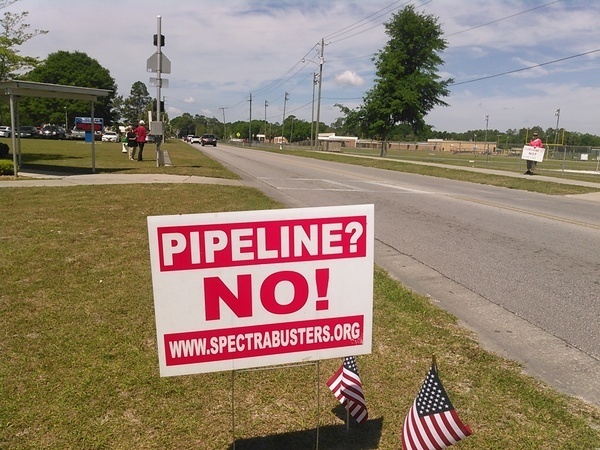 Most of the issues are the same for Spectra Energy’s invading Sabal Trail fracked methane pipeline as for Kinder Morgan’s invading Palmetto petroleum products pipeline that is the subject of the movie. Thanks to Push Back the Pipeline for getting this movie made about Kinder Morgan’s proposed petroleum products pipeline from South Carolina across the Georgia coast to Jacksonville, Florida. 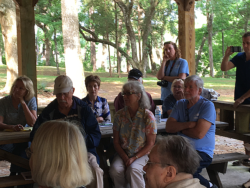 Special thanks to Eileen, Lori, and Debra and the Woman’s Club of Live Oak for the movie showing last night, to WWALS Watershed Coalition and the Woman’s Club of Live Oak for hosting, and to Our Santa Fe River, and Gulf Restoration Network for helping promote it. Don’t forget the hike to the Suwannee River Sabal Trail crossing 8:15 AM Thursday 28 February 2016 with Suwannee and Hamilton County Commissioners. The LNG export shell game: FERC, FE, MARAD, or NEB? 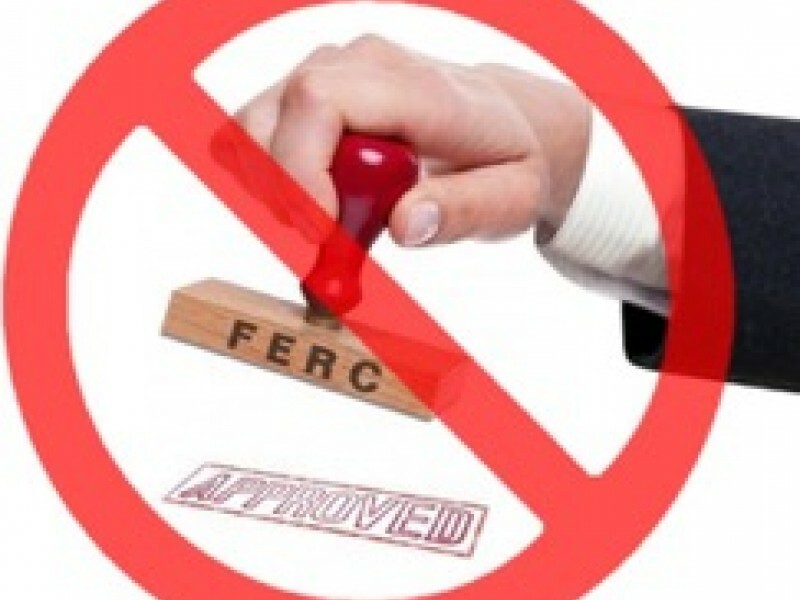 If you’re a Houston fossil fuel company and you can’t get FERC approval fast enough, try FE, or MARAD! If that doesn’t work, ship it by land through Canada or Mexico! Local property rights, they laugh at those! Rio Grande, Suwannee River, or Hudson River: just minor obstacles to greed! If the people are tired of profit being more important than their land, water, air, or safety, it’s time to stop this fossil fuel shell game. Please sign this petition for an independent investigation of FERC by the Government Accountability Office (GAO). Or call or write your own members of Congress and ask them to investigate FERC and rein in its rubberstamping of new fossil fuel projects. FERC has actually denied two pipelines out of a huge number of applications. Both were part of LNG import projects. One of them was about hardship to mineral interest donors, and a fair FERC would conclude hardship to everyone who depends on the Floridan Aquifer for their sole source of drinking water would be more than sufficient reason to deny Sabal Trail. The other`was a Spectra pipeline, so even mighty Spectra can lose at FERC. Citizens renamed Sabal Trail the Sinkhole Pipeline because it doesn’t belong in the sinkhole-prone karst limestone of the Floridan Aquifer. FERC can’t say they weren’t told, since videographers followed them through all four cities so far; see for yourself. 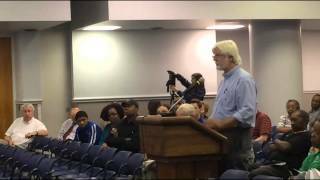 Gloria Gaines asks why a compressor station near school and subdivisions? Dinorah Hall’s concerns about righteous analysis is right on point. FlintRiverKeeper has Some Frightening Evidence!! Florida’s Governor Rick Scott owns Williams Co. and other pipeline company stock, and that’s an issue with FL-DEP’s intent to issue a permit for Sabal Trail, says the reporter who broke the Rick Scott conflict story a year ago. The Board of Trustees of Florida’s Internal Improvement Trust Fund owns the submerged lands, according to DEP’s notice. The board is comprised of the governor and Cabinet — Scott, Attorney General Pam Bondi, Agriculture Commissioner Adam Putnam and state chief financial officer Jeff Atwater.